To see the list of Residents, including profiles and photos, go here. 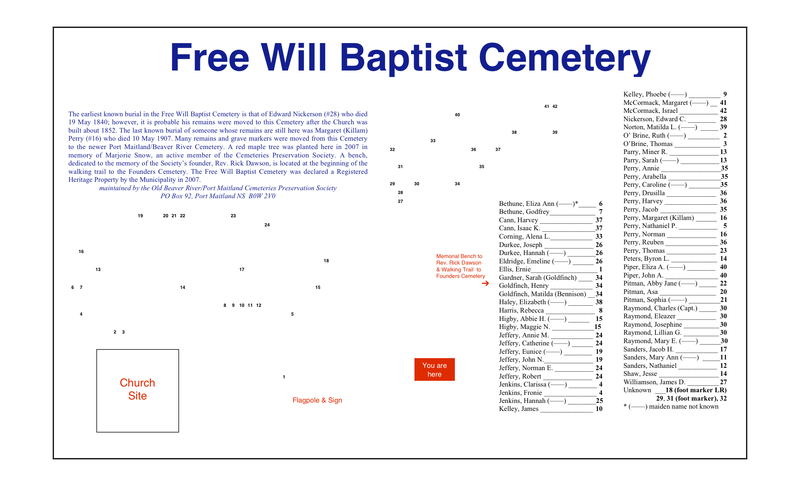 The Free Will Baptist Cemetery was established circa 1852 in the rural community of Beaver River, Yarmouth County, Nova Scotia when the church of that name was built on the site. It is located on Highway 1 about eight tenths of a kilometre north of Port Maitland. Municipal heritage designation applies to the entire cemetery lot and grave markers. 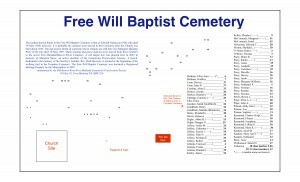 The Free Will Baptist Cemetery is valued as the burial site of many late nineteenth century residents of the area, for its remaining grave markers and as being one of three abandoned cemeteries in the area which in recent years have been restored by a volunteer cemeteries preservation organization. The Free Will Baptist Cemetery was established circa 1852 when the Free Will Baptist Church that stood on this lot was constructed. The earliest known burial was approximately 1855, when two people were buried here when they died within 3 days of each other. There were at least two earlier burials that appear as removals to Island cemetery, their burials were approximately 1852. The last known burial took place in May 1907; two years after the church was torn down. There were sixty-five known burials here, and about forty-five markers remaining. It is known that a number of the remains and gravestones were removed at some point to the larger, currently in-use community cemetery. Removals from one cemetery to another were apparently a relatively common occurrence until more recent years. 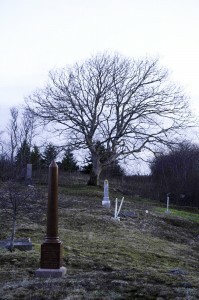 This is the first abandoned cemetery in the area to benefit from the efforts of the Old Beaver River/Port Maitland Cemeteries Preservation Society, which was formed in 1999 as the direct result of a letter written to the Municipality of the District of Yarmouth office requesting that the Municipality clear the dense overgrowth here and in a neighbouring cemetery for a family reunion. It was decided by the Society to “adopt” all three of the area’s abandoned cemeteries and to clear and maintain them and return as many headstones as possible to an upright position. This was the most densely overgrown cemetery of the three and took the longest to return to a state where it could be mowed on a regular basis to keep it visible. The old church’s cellar was filled in, the footprint of the building outlined with stones and a sign erected identifying the former site of the church. A flagpole and sign have also been erected to identify the cemetery and keep it in the public’s awareness. The cemetery is open year around. The maps, information panels and guest books are present from the end of May to mid-October. – location is on west side of Beaver Lake, north of the Port Maitland/Beaver River line, on the east side of Highway 1.